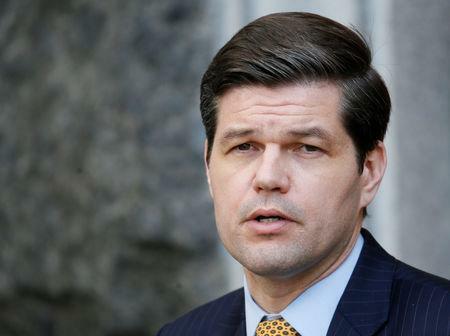 WASHINGTON (Reuters) - The top U.S. diplomat for European affairs, Wess Mitchell, has resigned, according to his resignation letter seen by Reuters on Tuesday at a time of strains in the trans-Atlantic relationship over U.S. President Donald Trump's policies. The trans-Atlantic relationship has been further strained by Trump's decisions to impose U.S. tariffs on European steel and aluminum, pull out of the Iran nuclear deal and global climate pact, and recently to withdraw troops from Syria. Ties with Germany have been strained over Trump's sharp criticism of German Chancellor Angela Merkel's migration policies and support for a Baltic Sea gas pipeline with Russia. He has also lashed out at French President Emmanuel Macron for his "low approval rating," France's near defeat to Germany in two world wars and accused Paris of unfair trade practices over wine. Pompeo said on Twitter that Mitchell had done "an outstanding job as Assistant Secretary." In his resignation letter, Mitchell said he had helped to craft the administration's European strategy and reorganize the European bureau at the State Department. He said he was proud of diplomatic efforts in sustaining transatlantic unity on sanctions against Russia, securing the release of American pastor Andrew Brunson from Turkey, and U.S. support for resolving a dispute between Greece and Macedonia over the former Yugoslav republic's name. "I am proud of what we have accomplished in creating and beginning to implement the Europe Integrated Strategy in support of the National Security Strategy and National Defense Strategy," he wrote. "The emphasis that these strategies place on the need to prepare our country and the nations of the West for sustained competition with big-power rivals is both urgently necessary and long overdue," he added.